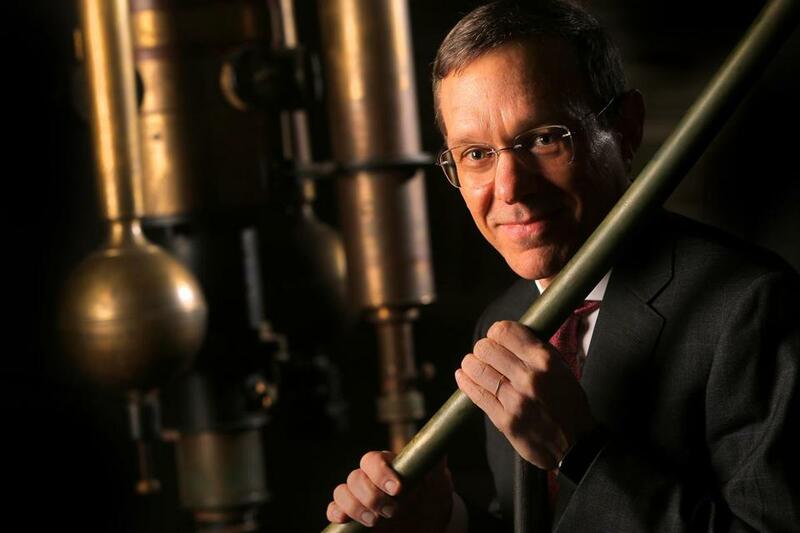 Avi Loeb with the 15-inch telescope known as "The Great Refractor," which was installed at Harvard in 1847. He’d been thinking about the phenomenon of ‘Oumuamua, a mysterious object that hurtled close to Earth in 2017. It had become an instant sensation in the scientific community, the first known object from outside the solar system, and astronomers and astrophysicists had jumped to analyze and explain the anomalous object. Theories were developed. Papers were published. Loeb had a theory, too, and late last year, he detailed it, along with coauthor and postdoctoral researcher Shmuel Bialy, in an article for The Astrophysical Journal Letters. Perhaps, he reasoned, the structure had been an artificial object sent from an extraterrestrial civilization. 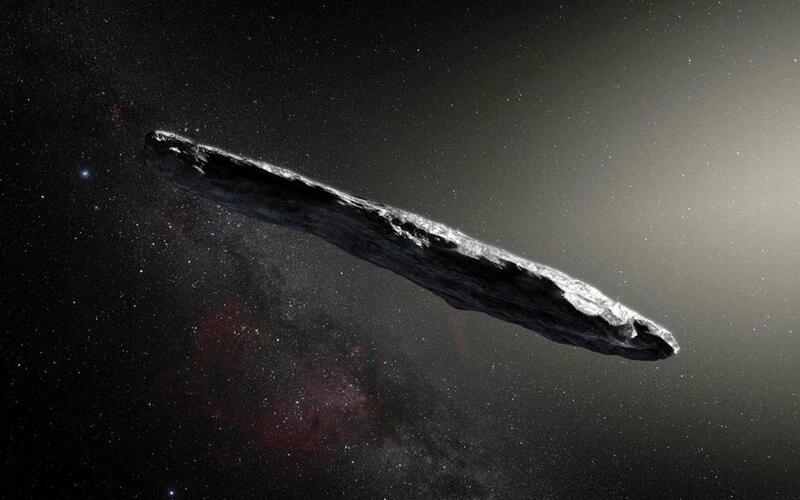 This photo released by the European Southern Observatory on Nov. 20, 2017, shows an artist's impression of the first interstellar asteroid: ‘Oumuamua. His work, he insisted, is not the result of some half-baked sci-fi fantasy; in fact, of the nearly 700 papers he’s written during the course of a decades-long career — including some that have touched on the possibility of alien life — he does not consider this one to be among his most speculative. In the case of ‘Oumuamua, Loeb said, he is simply using the available data to draw an evidence-based conclusion; namely, that the object — whatever it is — did not behave like it should have if it were a typical comet or asteroid. If it were a comet, Loeb said, its excess acceleration would have likely been apparent in the form of a tail of dust or gas. Another anomaly? Its extreme shape, which is unlike any asteroid or comet observed before. “Let’s put all the possibilities on the table,” Loeb said. Part of the high-profile response, certainly, can be attributed to Loeb’s academic pedigree. Irwin Shapiro, the former longtime director of the Harvard-Smithsonian Center for Astrophysics, called Loeb “brilliant.” Stephen Hawking once dined at his home. In 2012, Loeb was named one of the 25 most influential people in the field of space research by Time Magazine. Loeb’s office looks the way you’d imagine an astrophysicist’s to look: textbook-lined shelves, a whiteboard filled with mathematical equations. He subsists on a diet made up largely of sugar-free dark chocolate, which he credits with helping him drop a third of his body weight. He admitted that his wife once told him that she suspected he was left behind by aliens — and that when they return to retrieve him, she would appreciate it if the spacecraft doesn’t mess up the backyard lawn. His approach to science, he said, was forged during a childhood spent in an Israeli farming village. Growing up, he passed his days reading philosophy books in the village hills and writing notes to himself, and that early interest in philosophy — he didn’t move into the field of astrophysics until the age of 26 — has been critical in shaping his current work, providing a big-picture lens through which to view the world. Indeed, in the case of ‘Oumuamua, he has used his peers’ backlash to argue that scientific study has become far too conservative — avoiding controversial or unpopular examinations in favor of safer subjects that might earn a scientist an award or induction into a prestigious society, but are not necessarily conducive to substantial scientific advances. Rob Weryk, a planetary defense researcher at the University of Hawaii and the person who initially spotted ‘Oumuamua, said in an interview last week that there isn’t “any reason to believe that it’s anything but a natural object.” Paul M. Sutter, an astrophysicist at Ohio State University, went further, arguing that while Loeb’s paper itself is mostly harmless, the widespread attention it has received threatens to damage the field’s long-term credibility. Even within the hallways of Harvard’s Center for Astrophysics, where Loeb’s reputation is that of an efficient and prolific researcher, the report has been met with mixed opinions. Though many considered it a sound scientific piece, some have balked at Loeb’s premise — or the colorful language he’s used in subsequent interviews, including comparing himself to Sherlock Holmes. For his part, Loeb appears to have little interest in demurring. In the few months since the piece’s publication, he said, seven different filmmakers have reached out about the possibility of doing a film. He has been happy to field calls from media outlets across the world and is on the cusp, he said, of signing a deal for a book on ‘Oumuamua. As for his theory, he insisted he would be happy to back down, if and when it is proven invalid. “If someone would show me evidence — a photograph of ‘Oumuamua, or clear evidence that it’s natural in origin — then I would admit it and move on,” he said. Until then, he is happy to serve as a kind of modern-day Carl Sagan — enduring a few welts in the name of existential progress. “In the military, there is a saying: ‘If you’re a good soldier, you put your body on the barbed-wire so that others can pass over it,’ ” he said.